Reply, for 'Dr C. Robertson C(oncerning) Mr J. Henry'. 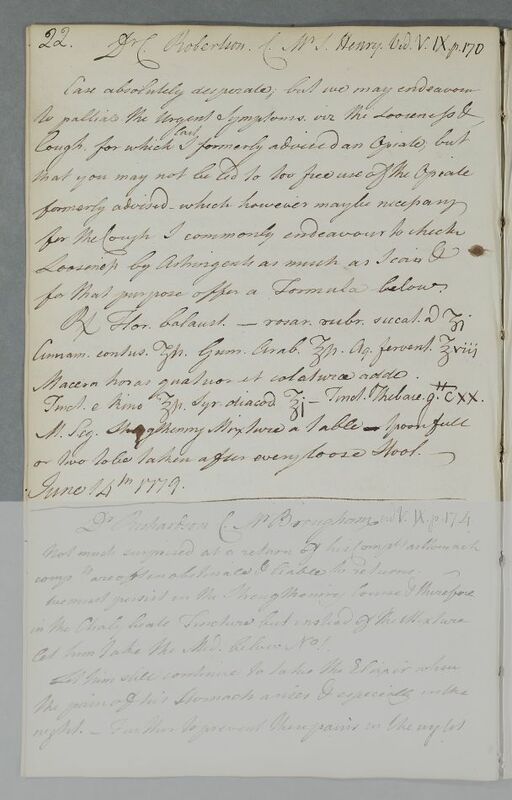 Summary Reply, for 'Dr C. Robertson C(oncerning) Mr J. Henry'. Case of the Rev. John Henry who has been greatly weakened by a bad cough which has not responded to his efforts to relive it by spending time in the country. for that purpose offer a Formula below. Take one drachm each of pomegranate Flowers and dried red rose, half a drachm of bruised Cinnamon, half an ounce of Gum Arabic and eight ounces of boiling Water. Soak for four hours, strain and add half an ounce of Tincture of kino, one ounce of diacodium Syrup and one hundred and twenty drops of Thebaic Tincture. Mix. Label: Strengthening Mixture. A tablespoonful or two to be taken after every loose Stool. Tinct. e kino ℥ſs. Syr. diacod. ℥j - Tinct. Thebaic. gtt CXX.